March 27, 2009- There’s no denying that the recession has changed America’s status quo. Watch the news to see white picket fence families living in pop-up tents because the bank foreclosed on their mortgage. Turn the channel and see the once-wealthy criminals being escorted into court after years of unregulated financial deceit. Flip again and learn how to grocery shop for a family of 4 for less than $40 a week. The financial crisis is changing everyday life – across all socioeconomic stratospheres. The rigid lines that once defined the haves and the have-nots are being blurred by an economy that put people in positions they never imagined they’d find themselves. Our students and their families are no exception to the rule. While the federal government is promising that help is on the way to education, families are still grappling with how to approach college admission, and looking to those of us in the industry for advice. Undeniably, college cost is becoming more of a factor in college attendance, meaning that even the most talented students are re-evaluating their college choice based on projected debt burdens. In our network, we see that students are applying to more public schools than ever before; a 10% increase in one year. This leads to other shifts in a system, which has remained unchanged for decades. The pathway of “brightest talent” to “elite high school” to “selective college” to “top employer” is muddied. Colleges have long known that best performing students don’t necessarily come from a prep school in New England or a private high school in Orange County. So they have been focused on adjusting their recruitment models to identify top talent in places they haven’t ordinarily looked. However, in order to fully complete the path, the question becomes- will employers be adjusting as well? Will they begin to broaden their recruitment efforts to a wider audience of colleges … recognizing that in this economy many of the best and brightest will not be pursuing the private elite for their post-secondary education? Deloitte is one of the nation’s most notable organizations and has joined the ConnectEDU National Network to identify top talent in places they haven’t traditionally recruited. Instead of meeting new talent at schools considered “top feeders” for the working world, they are using technology to search for and build relationships with high-performing talent at schools all across the country. They are interested in meeting the Westinghouse Award winner who graduated from CUNY or the Rhodes Scholar finishing their last semester at the University of Georgia. Greenery crawling up brick facades is no longer the only backdrop. Their scope is allowing them to recruit from a pool of the very top performers at a wide variety of colleges as opposed to the top 100 performers from a small pool of colleges,… and therefore they are also diversifying the thinking and increasing the competition! Other organizations are quickly realizing that they must broaden the number of schools for their outreach plans as our top talent broadens its reach across higher education. ConnectEDU has recently partnered with the Massachusetts High Technology Council, a group of CEOs developing an employer/student relationship model in Massachusetts that can be replicated all across the ConnectEDU National Network. With innovation, together we can build a better system of identifying and developing tomorrow’s workforce that truly changes the status quo and ensures that the very brightest are uncovered, regardless of the financial pressures that might impact their college decision making. March 13, 2009- If you’re like me and follow the trials and tribulations of our Millennials, you know what I mean when I refer to a small segment now called the “entitled generation.” Maybe you can’t pinpoint their birth years, but you know all about them. They grew up where everyone received a trophy for signing up for t-ball, let alone showing up. They can tell you exactly how many marbles it took to fill up their classroom’s marble jar. And they’ve spent more time in time-out than the Celtics accumulated all last season. True, most people in this age group have followed in the foot steps of Generation X and the Boomers by working hard and earning their keep, but we still hear generalizations about those who believe they deserve what they get unconditionally. You recognize them, too, because somewhere in your organization there’s one working for you. They come to you fresh out of school with no experience, expecting the compensation and positioning of senior management. They demand a bonus and expect it to be of the same value as the person in the cubicle next to them, regardless of merit. And they are the ones with the bullhorn at every company meeting. Some call it confidence, others call it entitled. I don’t have to tell you. Times have changed. This week, the new administration in the White House let it be known that the federal government is raising its expectations for young people. While there are plans for more support and added resources for our students, there is also an expectation for accountability, for merit, and for earning what you receive. I was recently asked by Lisa Black of the Chicago Tribune to comment on how these changing times are impacting our young people. In our network for example, we’ve seen dramatic changes in how students are approaching college admission; based on 1)the increased number of colleges on their colleges lists and 2)the shift of interest in more affordable public schools compared to the more costly private schools. They’re becoming smarter and more informed. They’re exploring more options and being better prepared. They’re not waiting for things to be handed to them anymore and they’re being more pragmatic about their situations. Our young people are rising to the occasion. So, perhaps the “entitled” label has come and gone. Maybe realizing that things can change with the blink of an eye has helped young people redefine their priorities, set new expectations, and succeed as one of the most distinctive generations of our time. I just hope our colleges and employer environments can change quickly enough to meet their needs. March 6, 2009- Ever listen to an older person tell stories of how things were different in the good old days? Channel surfing was your youngest kid turning a knob after adjusting the tin foil antennae. Global positioning system meant stopping at a gas station to ask the teenage clerk what state you’re in. And checking your mail actually required walking all the way to the end of the driveway in rain, sleet or snow. Even with all our new technology, high school seniors all across America are still trekking to the mailbox for the answers to the question: did I get in? If you follow the college admission process you know March is when the final round of acceptances and denials land at millions of homes. In 2009, the economy has certainly changed the story for the college-bound population and added the question: can I afford to attend my school of choice? That’s why students are doing their homework and making sure they keep their options open as decision time approaches. How can we tell? We found in our network that more public colleges made their way onto college lists. We know enrollment at community colleges is up. We learned more financial aid assistance is being sought. Just last month in Florida and Texas, we presented our network with two on-site financial aid seminars to more-than-sold-out crowds of hundreds looking for advice. Families are getting smart about how to navigate this process. That’s why transparency into expectations and the availability of information has become so keenly important this year. 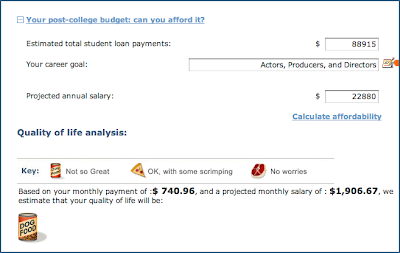 This month, I participated in a discussion with bankrate.com on how to “land more financial aid”. While some experts’ recommendations make perfectly good sense for this year, last and next year as well (like meeting deadlines) it’s interesting to see the shift in how colleges have incorporated financial into enrollment management. It wasn’t uncommon in the past for a student to receive his or her award packages, pull each one up side by side, and choose the school that appeared to offer the most aid….no questions asked. Now students are taking a closer look to distinguish between a grant or a tuition discount, a private loan and a PLUS loan, or even the disparity between similar colleges’ breakdown of aid. It’s just another example of families getting smart about the process. Colleges too are changing the way they do business in the financial aid office when it comes to admitted students. Remember, they wouldn’t be in the business if they didn’t want to see young people succeed. They’re not interested in setting students up to default on loans. Keep in mind, they’re partners in the process, not adversaries. Even more so than in years past, students are able to approach the financial aid office to tell their story, should they feel their economic situation deserves a second look or has changed and could be adjusted. While the endless FAFSA may seem like it captured everything, there may be some circumstances that a financial aid officer may need to evaluate your situation. Remember, it’s not about bargaining or seeing what you can get way with. It’s about providing information to get to a manageable outcome, for all involved – families and colleges. So as students evaluate their decisions we are encouraging them to take advantage of the technology and tools that we offer – like comparing projected debt burden and payback payments to the starting salaries for their career choice. And we use some “old fashioned” images to help our students understand the dilemma… like a can of dog food, piece of pizza, or slice of steak… even someone from the old school can interpret what those debt burdens mean.